Michael: Are most of you use to finger picking? tj: This is a little hard to do. Michael: Take it slow and use the slow feature in the tab control. Michael: The next part actually plays over the B chord position, then it descends back into the I (E) of the progression. Here's the last lick. Michael: You can play this lick over the I (E) of the progression. It jumps around using the Major & minor 3rd intervals. 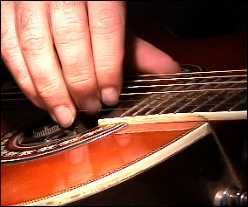 This lesson should help you understand so very interesting techniques in play acoustic delta blues. See you next lesson!